2013 was a fantastic year for Radware on the research front. We released numerous studies and blog posts about topics ranging from ecommerce performance to the neuroscience behind mobile user expectations. Below I’ve corralled 55 amazing things you should know about how your visitors use the web. 1. 44% of online shoppers say that slow online transactions make them anxious about the success of a transaction. 2. Shoppers remember online wait times as being 35% longer than they actually are. 3. A progress bar on a page that loads in less than 5 seconds or less will make that page feel slower than it really is. 4. 51% of online shoppers in the US say that site slowness is the top reason they’d abandon a purchase. 5. A 2-second delay in load time during a transaction results in abandonment rates of up to 87%. This is significantly higher than the average abandonment rate of 70%. 6. 18% of shoppers will abandon their cart if pages are too slow. 7. The total cost of abandoned shopping carts for online retailers has been estimated at more than $18 billion per year. 8. If 18% of that loss can be attributed to slow pages, then this correlates to more than $3 billion in lost sales (across US ecommerce sites) due to poor performance. 9. 46% of online shoppers cite checkout speed as the number one factor that determines whether or not they will return to a site. 10. 64% of smartphone users expect pages to load in less than 4 seconds. 11. If a page takes 8+ seconds to load, visitors will spend only 1% of their time on page looking at primary banner content. 12. The performance poverty line (i.e. the plateau at which your website’s load time ceases to matter because you’ve hit close to rock bottom in terms of business metrics) for most sites is around 8 seconds. 13. When pages are slow, business metrics suffer more now than they did a few years ago. For example, a page that took 6 seconds to load in 2010 suffered a -40% conversion hit. Today, a 6-second page takes a -50% hit. 14. 85% of mobile users expect pages to load as fast or faster than they load on the desktop. 15. 35% of mobile users will choose to view the full site when given the option. 16. Mobile users who shop the full site spend more than those who shop the m.site. We found that, for every $7.00 of mobile-generated revenue, $5.50 (79%) was generated by mobile shoppers using the full site. Only $1.00 (14%) came via m.site, and $0.50 (7%) via the mobile app. 17. 55% of all time spent on retail websites takes place on a mobile device. 18. Mobile commerce accounts for an estimated 16% of total online sales. 19. Mobile users are significantly affected by slow performance. A 500ms connection speed delay results in up to a 26% increase in peak frustration and up to an 8% decrease in engagement. 20. Only 2% of the top 100 ecommerce sites loads in fewer than 4 seconds on smartphones, while 20% take 10 seconds or longer to load. The median site loads in 7.84 seconds. 21. The abandonment rate for mobile shopping carts is 97%, compared to 70-75% for desktop carts. 22. When faced with a negative mobile shopping experience, 43% of consumers will go to a competitor’s site next. 23. 80% of online retailers have a mobile-specific site, up from 76% in 2012. 24. 1 out of 5 m.dot sites don’t allow users to visit the full site from their mobile device. 25. 31% of retailers serve the m.dot version of their site to Android tablets. 26. 6% of retailers serve the m.dot site to the iPad. 27. The median retail web page loads more than twice as fast on the iPad 3 as on the iPad 2. 28. Performance varies hugely among smartphones. Median load times range from 3.1 seconds to 11.4 seconds, depending on the device. 29. The median leading ecommerce site takes 5.3 seconds to become interactive (i.e. render primary content “above the fold”) and 8.56 seconds to fully load. 30. This represents a 26% slowdown since spring 2012, when the median page took 6.8 seconds to load. 31. Only 18% of the top 100 sites have a TTI (time to interact) of 3 seconds or less. 32. 26% of the top 100 sites have a TTI of 8 seconds or more. 34. The average web page has grown 151% in just three years. At the end of December 2013, the average top 1,000 web page was 1575 KB. When the HTTP Archive began tracking this data three years ago, the average page was 651 KB. 36. 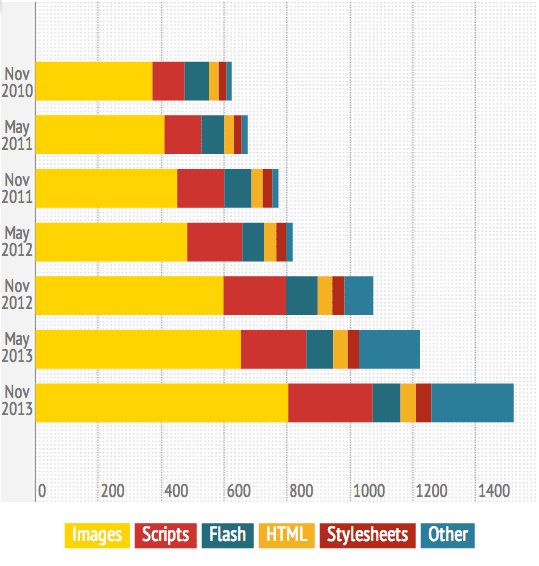 Today, 38% of pages use Flash, compared to 52% in 2010. 38. For many sites, 36% or more of desktop page weight comes from 3rd party scripts. 39. The median leading ecommerce site is 1258 KB in size and contains 92 resources. 40. Median load time among leading European ecommerce sites was 7.04 seconds. 41. 1 out of 4 pages took more than 10 seconds to load. 42. 1 out of 3 pages contained more than 100 resources. 44. 1 out of 5 sites failed to implement text compression, a relatively simple technique that delivers easy, significant performance gains. 45. 99% of response time problems are still caused by the UI being too slow. 46. Content delivery networks may be only somewhat effective for mobile traffic. In a case study of the O’Reilly website, we found that using a CDN decreased doc complete time by 10% for mobile users, compared to the 20% improvement we noted in a similar experiment for desktop optimization. We shaved less than a second off start render time, taking it from 7.059 seconds down to 6.245 seconds. 48. Implementing an automated front-end optimization solution alongside a CDN can make pages up to four times faster. 49. Only 3.6% of all page views per month are WPO-accelerated. 50. The folks designing HTTP2.0 claim an easy 30% performance increase on websites with HTTP2.0 / SPDY. 51. 50% of your 1-second page load time budget on mobile is taken up by network latency overhead. 52. In one study, median desktop latency ranged from 65-145 milliseconds. 53. In the same study, mobile latency fared even worse, with a median range of 90-190 milliseconds. 54. Browser development can’t keep up with the demands of increasingly large and complex web pages. For all three browsers, median load times slowed down by anywhere from 3% to 12% in just six months. Do you have questions about these numbers? Amazing numbers of your own? Let me know in the comments! This is really very wonderful post and informative post. I really appreciate it, this post is very helpful for web based application. Awesome post! Random question: do mobile figures include tablet? Thanks, Lauren! To answer your question, all the mobile figures include tablet unless specifically noted otherwise. I have been doing a lazier version of this not realizing it’s a link wheel. Sharing is caring. This statement is true and platforms like Madcards have lived up to this saying.This online platform allows the users to share the latest events and offers that a shop might be offering. Users can collect the cards and share it with others. What say, guys? Is this not great.!!! Love the fictional toon character? Well, with sites like Madred.org, the Internet is a rich house of Pokemon images. From video stills to snapshots of games, GIFs, and images of merchandise, such sites have it all. To add these pictures to your Pokemon collection, visit the big web today. Thanks for sharing a very intresting information about 55 Web Performance Stats You’ll Want to know. This is very useful information for online blog review readers. Keep it up such a lovely posting like this. Really the article is very good. I think you studied fully about the ecommerce websites. I too got experience when i tried to purchase a product from one of the ecommerce website. The slow online transaction makes me to getout from the website. Online shopping is considered to be a very helpful way of buying products through the internet especially during the holidays and clearance seasons. It allows customers to enjoy a wide variety of products and items not only from a specific store, but from a diverse storage that includes all kinds of items. back. It’s refined, and delicate, and beautiful. Pingback: 10 Tips That Can Drastically Improve Your Website’s User Experience | Welcome to JudahCo! Buy the products you need now or later. Our site is design for you to pick your own shopping date and more – thousands of products to choose from. Brilliant, thanks for sharing this info. This is all very interesting. What I have found is that I can directly control all facets of my twitter account. import contacts from the email account connected to the Linked – In account. Thank you for sharing the data. Great data. Curious if you have updated the analysis as the original set is going on three years old now and technologies and strategies have changed. Thank you for sharing! A very interesting list! Thanks for the reminder, we often get so caught up in delivering good content that we forget that the layout of the site might mean it doesn’t get read! Interesting to know that the text gets looked at more than pictures. The numbers speak for themselves. If you want to remain competitive online, monitoring your website’s performance isn’t optional. It’s necessary. What’s the easiest way to monitor web performance? We invite you to learn more about Creatix9 and the many valuable services we offer. thanks for sharing this wonderful ideas with us. Next PostLoad balancing and application delivery in VMware vCloud. How to best serve your applications?